If you’re the type of person who likes to go out for picnics or just wants to be prepared for the next time you go shopping for something that needs to be kept cold, having a great cooler is important. But you don’t want to lug around a huge, heavy cooler when all you need is something small, right? The best small cooler is going to be one that fits in your vehicle easily and this small cooler buying guide and small cooler reviews will help you find it. Capacity: How much is that cooler going to hold? Can it carry just a couple cans of soda? Or maybe it can hold your lunches too. Maybe you want something that will even hold enough for the entire family. It’s up to you. Type: Is the outside of the cooler hard or soft? This is generally a personal preference but it could be a space issue as well. A soft sided cooler will fit into a smaller space than a hard sided one will provided there’s a little space inside. Color: This is going to be your personal preference but you may want a cooler that’s a specific color. Maybe you want a couple that are different colors so you and your partner or your children can keep your own separate. Carry Style: How can you carry the bag? Does it go over your shoulder? Do you carry it in your hand? This is about convenience, but also about personal preference, since you might want to carry it a certain way when you use it. Size: How large is the cooler itself? The specific dimensions can be important if you’re trying to fit it into a specific space. Maybe you need it to fit in your trunk or in between the seats of your vehicle. The size will matter then. Leak Resistance: Is it designed to resist leaking? Chances are pretty good that you don’t want a cooler leaking in your vehicle or anywhere else you go, right? So having a cooler that’s leak resistant could be a very important part. With so many different cooler bags out there it can be difficult to find the best small cooler for sale. That’s why we’ve taken the time to compile the best cooler reviews so you can make sure you choose the top product for your needs. Each of these coolers is one we think will help you have a great time, no matter what your plans are for the day. Our top pick of best cooler for the money is a little bit unique, but it’s actually a bag that you can carry over your shoulder to keep your drinks (or anything else you want) cold. This 15 liter bag has a roll top closure and comes in a variety of different colors, so you can easily pick your favorite. Even better, if 15 liters is too big or too small for you there are other size options available as well. 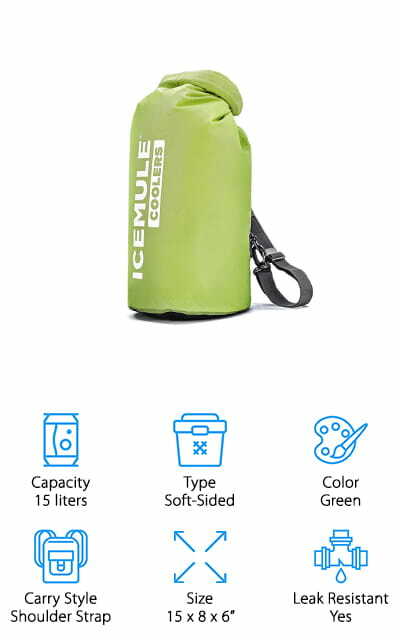 The detachable shoulder strap makes it entirely hands free while you’re walking or climbing and it provides you with 24 hours of ice to keep everything cold. Completely waterproof, this bag can survive just about anything without leaking. Lightweight and simple to use, this is definitely a bag that you’ll be able to throw in your vehicle or take on that next long hike. The soft sides also make it easy to store anywhere you need or even strap it to your vehicle. Our best cheap small cooler is a great option that lets you carry up to 9 cans in a totally hands free way. That’s because it has a shoulder strap that you can easily slip on and go. The soft exterior actually has a solid interior that makes it more durable and helps to keep your drinks colder. 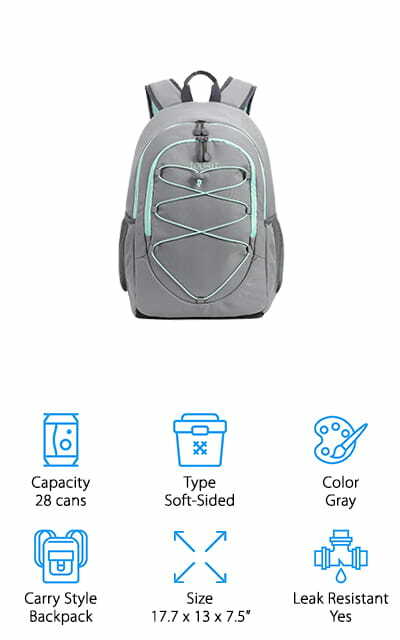 It’s available in 4 different colors so you can pick your favorite and actually has side pockets to carry other items for you. 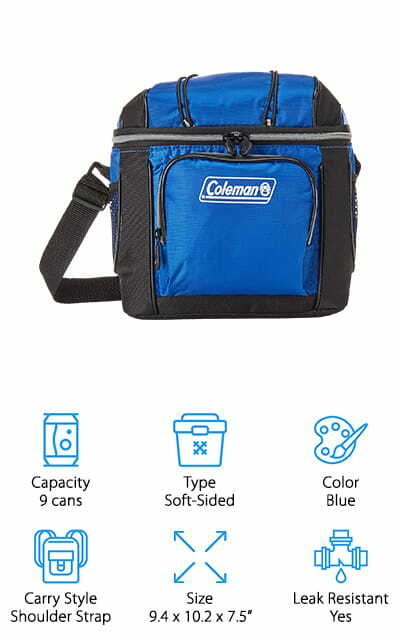 Made by Coleman, a company well known in outdoor gear, this bag is leak free and has a germ resistant liner. You’ll be able to keep anything you want cold for up to 24 hours and you’ll be able to clean the entire thing out easily as well. Use the attached pockets and bungee cords to store even more and even take out the hard inner liner if you don’t want to use it. This bag is versatile and just the right size for your next trip. This Rubbermaid cooler may be exactly what you think of when you remember going on picnics or trips with the family and could be your best car cooler. It’s available in sizes from 5 quarts all the way up to 60 quarts and comes in both red and blue. This hard sided cooler has a swing carry handle and is entirely stain and odor resistant. Able to hold up to 6 cans, it’s actually made in the USA and has an attached lid so you don’t have to worry about losing it. Rubbermaid is well known for coolers and other kitchen products and the double walled construction of this cooler means that it keeps everything cold. The cooler itself is BPA free and moderate weight so you can take it along with you wherever you want. You can even attach your own ice pack inside to keep it colder and more secure. All you’re going to need now are some snacks and drinks to keep cold. This 16 can cooler definitely looks sleek and stylish and you’re going to love taking it along with you everywhere. It has several outer pockets that let you store just about anything you want the inside has a radiant heat barrier to provide you with deep freeze performance. It has a zipperless lid design with a clasp and excellent sealing capabilities to keep the heat out and the cold in. This shoulder bag looks soft, but it’s actually a hard body case and even has a shelf inside to keep your food secure. The leak proof lining is also easy to clean, making it great even for those little accidents. In case you need something a little bigger you can even get options that hold up to 48 cans and they come in different colors as well. Designed to keep ice for up to 2 days, this bag also has a back saver strap to keep you more comfortable and proves it’s the best cooler for a number of reasons. This 6 can capacity cooler is another one that’s likely synonymous with your childhood. 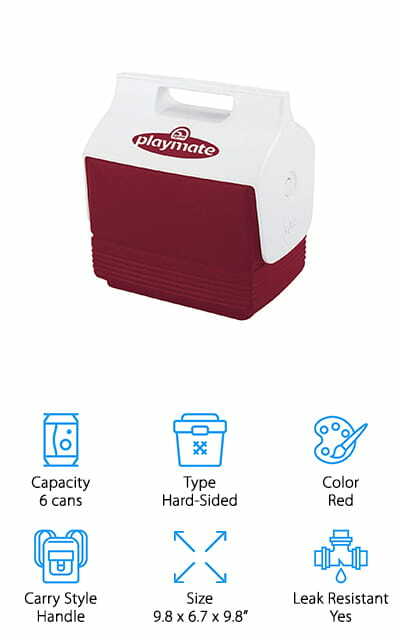 The side button and swivel top are simple to use and allow you to easily lock the cooler or open it. 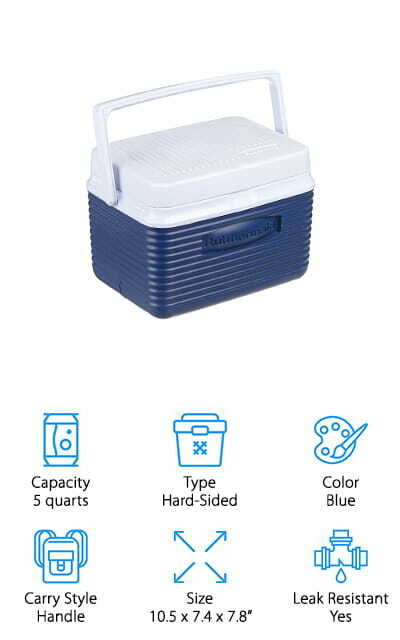 The design also makes it impossible for the cooler to open while you’re carrying it, reducing the risk of accidents or spills. 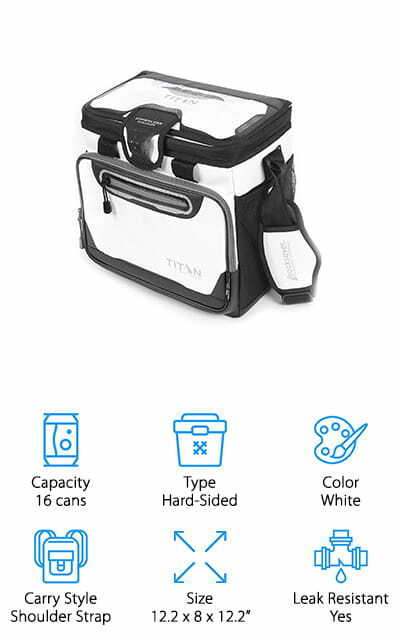 Able to open on either side, this cooler also has a molded handle that makes it even easier for you to carry along with you, no matter where you want to go. Easy to wipe out if there is any mess, this cooler is made by a company that’s known for high quality in the cooler field. This lightweight cooler has a hard exterior, which makes it durable, and is great for personal use because of the small size. Of course, it would be great for shorter trips if you’re looking for something easy to carry drinks along with you as well. If you want something really convenient and versatile then this backpack cooler is a great way to go. If you don’t need to use it for a cooler you can easily carry anything else you want. But of course, it’s best as a 28 can cooler to carry everything you need for a day out. The stylish design is available in 4 different colors and has a large main pocket as well as several additional pockets to keep everything sorted where you need it. The high-density material provides quality insulation and it has a leak proof liner to make sure you don’t lose your ice. Lightweight and easy to carry, this backpack is also water resistant, so you don’t need to worry if it gets dropped in a puddle. The 25 liter size means it can carry anything you need but it’s not too big to take even on shorter trips as your best beer cooler. 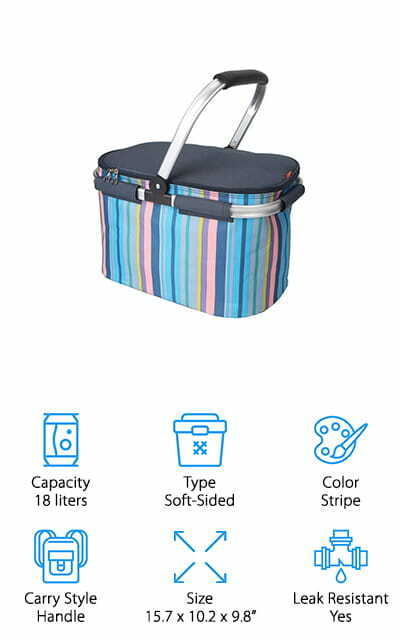 This best soft sided cooler is great for short trips or individuals who need to carry something small around. It’s available in black and blue and actually holds up to 16 cans. It’s soft sided, making it easier to store wherever you want and has a leak proof liner so you don’t have to worry about water getting out. You can easily store silverware and other items in the pockets outside and trust everything else will stay ready on the inside. It is even easy to clean with a damp cloth and can be adjusted to carry by hand or over your shoulder. All you need to do is put in your ice packs and it will be ready to go for several hours, keeping everything cold. If you’re heading out on a longer trip you can store all of your drinks here or some of your snacks or even fixings for your sandwiches. If you want a best soft cooler bag that’s going to look nice and help you carry everything you need for that next picnic then this is a great way to go. 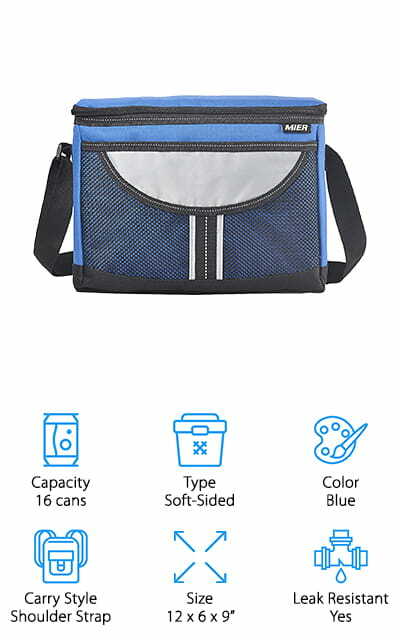 This cooler bag actually collapses down on itself, which makes it even easier for you to take with you, anywhere you want to go. When you fill it up you’ll have 18 liters of space, which is plenty to hold your drinks, snacks or even your lunch. It’s also available in larger sizes and has a leak proof lining that can be removed to clean even easier. 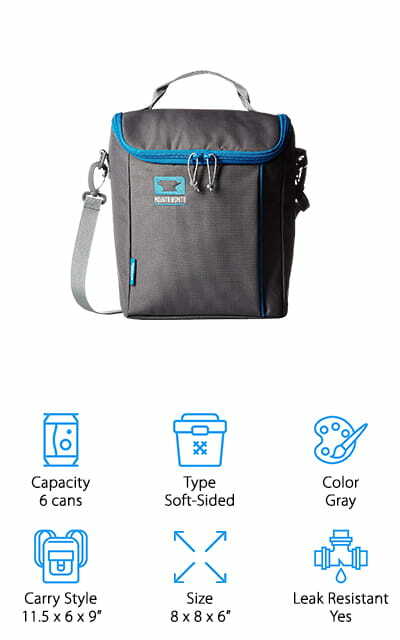 Able to keep anything you want cold for up to 4 hours, this cooler bag even comes with a 180 day warranty. The standard bag comes with one handle with a soft, molded handle, to make it easier to carry. The picnic basket style comes with two handles to balance out the weight. No matter what you want to carry, this sleek bag is definitely going to help you do it. This bag may not look like much, but it’s definitely something you can count on. 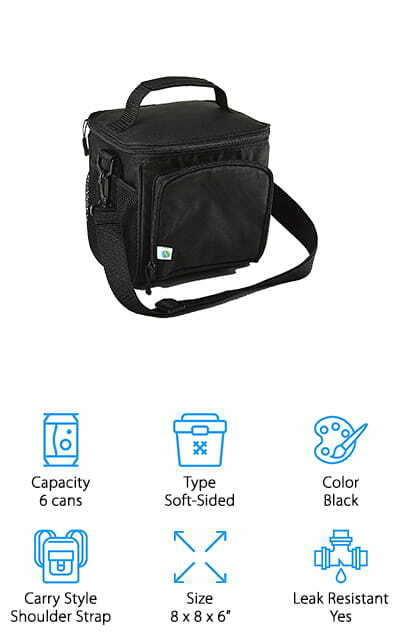 The 6 can cooler is small, but that means it’s a great choice for you to use as a lunch box or just for your next trip to the beach. The solid black color is sleek and means that it won’t get dirty when you leave it sitting on the sand. It has a shoulder strap that makes it easy to carry and the soft sides mean that it can be stored just about anywhere you want. Completely BPA free and easy to clean, you can also store other items in the outside pockets. Available in several different colors for your preference, this bag is inexpensive and lightweight, making it a great option for just about any use. It’s even leak proof so you don’t have to worry about anything leaking inside and making a mess. This soft sided cooler bag comes in a stylish gray with a little bit of blue accent. It has a handle as well as a shoulder strap that make it easy to carry just the way you want and it’s moderately priced as well. The barrel top closure makes it easy to get in and out of the bag when you need to and the PEVA seam and lining means that there won’t be any problem with leaks. You can even put up to 6 cans or bottles inside or store your favorite snacks and treats. For those who want a few more options, you can choose between several additional colors as well. You even get a bottle opener included so you’re ready to go for your next trip. You’ll have extra pockets to store non-cold items and a simple bag that works for a trip or work.